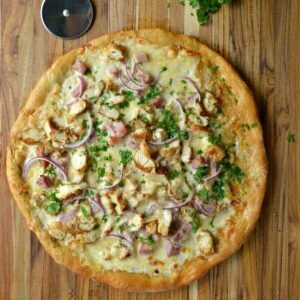 This insanely delicious Chicken Cordon Bleu Pizza starts with a creamy garlic sauce and is topped with ham, chicken, onions, and Swiss. Once slice won’t do! This post is sponsored by CuttingBoard.com. I use all kinds of tools in my kitchen, but none see more use than my cutting board! So I partnered with CuttingBoard.com to share some good wood. All opinions are my own. 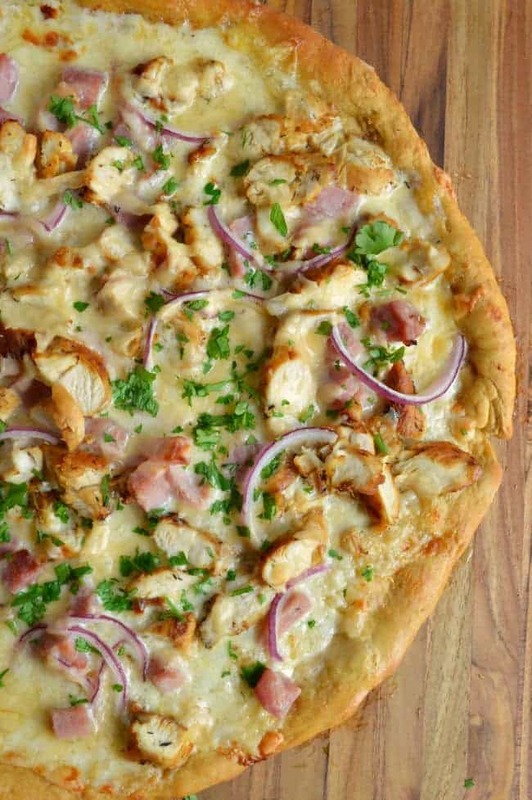 I made you this Chicken Cordon Bleu Pizza. And then I spent a really, really long time deciding if I should say ‘bleu’ or ‘blue’. Like… an unreasonable amount of time. Survey says: we are going with both. It’s a Chicken Cordon Blue Pizza. 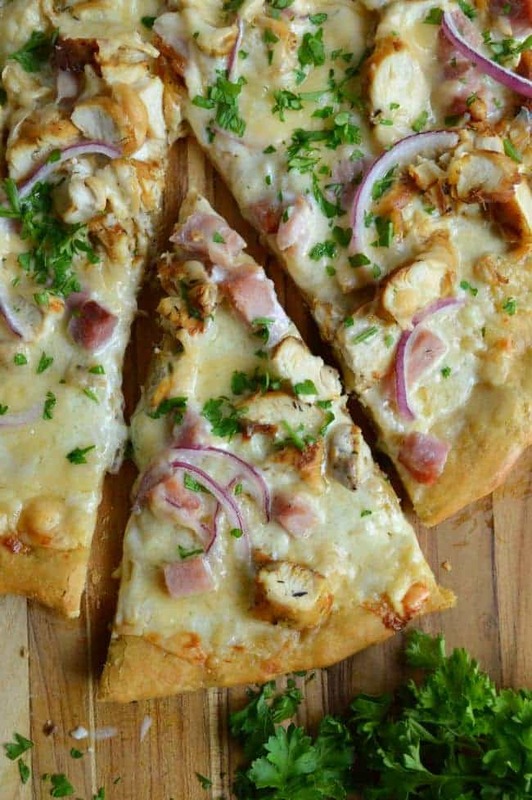 It’s also a Chicken Cordon Bleu Pizza. Enough with semantics already, right? We have more important things to discuss. FIRST! Being these pizza toppings. And second being the gorgeous cutting board they are laid out on. This thing is huge, ya’ll. That’s a half a ham in that photo! And I still had plenty of room to move! Likewise, in the photo below, I fit a whole pizza on this baby. With lots of room to spare. Remember last month when I blasted your Instagram feed with all of my kitchen remodel photos? Well I am still working on the finish details (photos to come soon!) but essentially, I installed a 74″ X 64″ countertop. It’s massive. I am in love. I have room to work, room to spread out, and room for a cutting board that will get the job done. I’ve been longing for a big pretty board for my kitchen for forehhhhver. But after we exploded most of our house, I was reduced to barely any counter space. So my cutting board wants stayed on the wishlist. The cutting boards in my kitchen see as much action as my sink! I’d say that they are the tools that see the MOST activity. And when something sees that much use, it really pays to work with something nice. QUALITY! CuttingBoard.com is a boutique retailer of cutting boards and butcher blocks. They also happen to carry one of the widest selections of John Boos boards (you know! The pretty ones they show on MasterChef!) and take care to house their boards in a climate and humidity controlled warehouse. From the way they lovingly oil and paper wrap your new board, you can tell that they consider each one to be a work of art. I was lucky enough work with one of the boards they carry for this post. Pictured here is the Proteak Edge Grain Rectangle. It’s a great big sturdy board that cleans easily and has a beautiful grain. It has totally held up to my daily abuse and is the nicest board I have ever had the chance to call my own. L.O.V.E. Okay. So back to this PIZZA. It is unbelievable. The creamy garlic sauce is on point and easy to make. The chicken is tender with a hint of thyme. The ham is salty, the cheese is mild — it is fair to say we adore this recipe. You can make it super fast with a store bought pizza dough, or you can linger over the details and take your time by making your own crust. You can also try it with my 10 Minute Pizza Dough from Scratch! 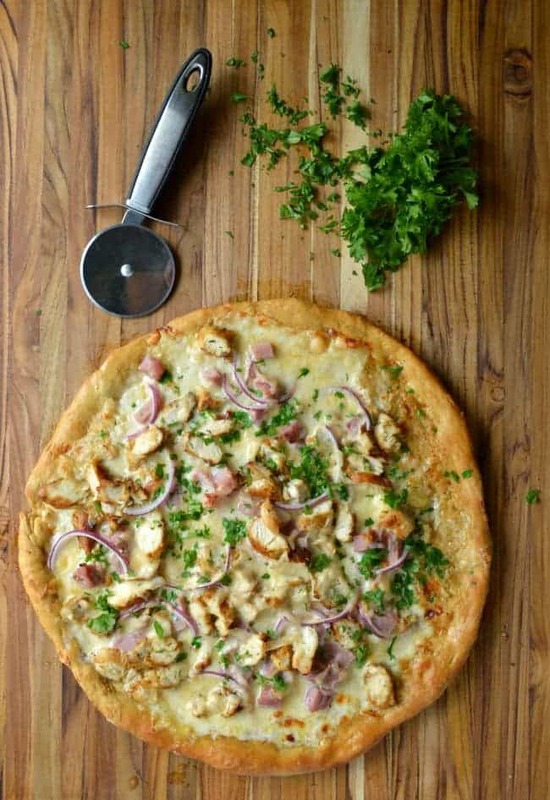 Chicken Cordon Bleu Pizza + CuttingBoard.com Giveaway! Preheat the oven to the temperature specified on your pizza dough packaging or recipe (I set mine to 525F). If you are using a pizza stone, make sure to preheat it with the oven. Stretch your pizza dough across the pan you are using (or your pizza peel). Set aside. To make the Creamy Garlic Sauce, heat the oil in a small saucepan. Add the minced garlic and cook for 1 minute. Add the butter and let it melt. Pour in the cream and let it come to a simmer over medium high heat. Remove it from the heat and stir in the cheese until the sauce is smooth. Set aside. To make the chicken, heat the oil in a medium skillet. Add the chicken and sprinkle them with the dried thyme, salt, and pepper. Brown one side, and then the other, cooking over medium heat. If the pan seems dry, slowly pour in the water. It will evaporate as the chicken continues to cook. Check that the chicken is cooked through and remove it to a cutting board to cool. Ladle half of the creamy garlic sauce over the prepared pizza crust. 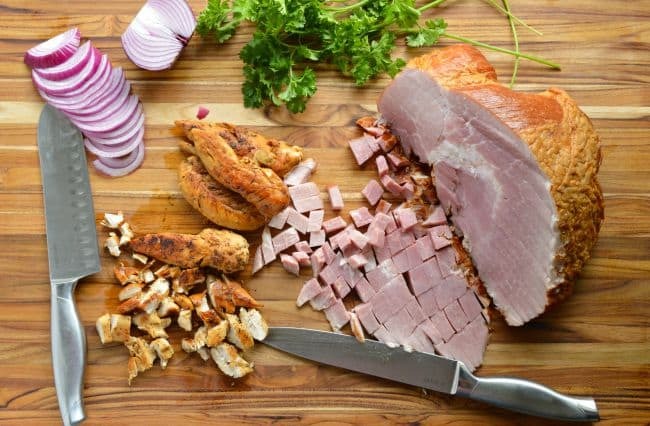 Top with half of the chopped ham and red onions. 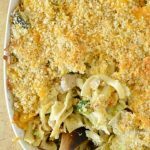 Sprinkle with half of the shredded Swiss. Slice the chicken tenders and place them over the cheese. Bake for 10 minutes, or until the crust is golden and the cheese is melted. Garnish with the chopped parsley. 1. This recipe makes 2 whole pizzas! I feed hungry guys and love leftovers, but if you need less this is easy to cut in half. 2. If you only make one pizza but choose to make the whole sauce recipe, you can save the unused portion of sauce and serve it with bread or pour it over pasta. CuttingBoard.com features the web’s best selection of curated cutting boards and butcher blocks. Owners, Mike & Grant, have personally selected and chosen their products after handling and seeing each piece with their own eyes. Many of the their products are sourced from independent artisans and woodworkers that only make limited runs of each product. In addition, Cuttingboard.com also carries high quality knives and kitchen accessories that will accentuate the kitchen of any home chef. 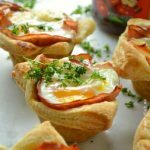 Yummy recipe Heather; my husband would love it. 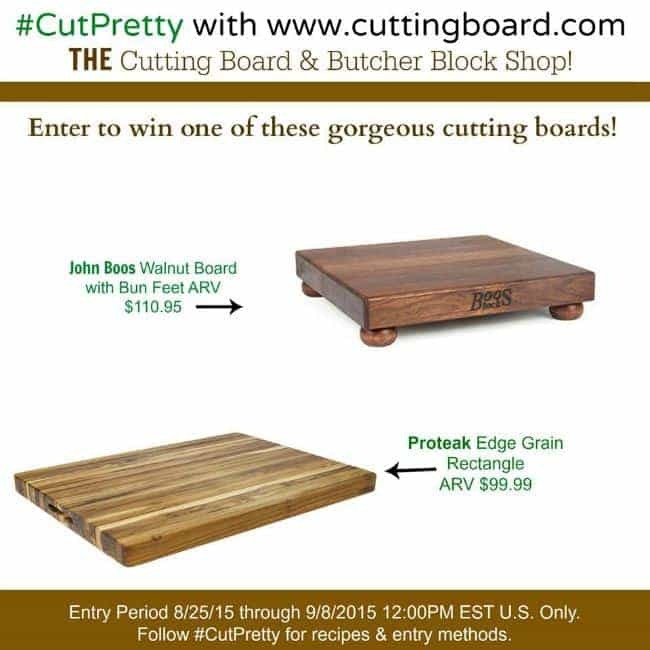 I’ve entered other giveaways attempting to win a John Boos cutting board. Thank you for another possibility! 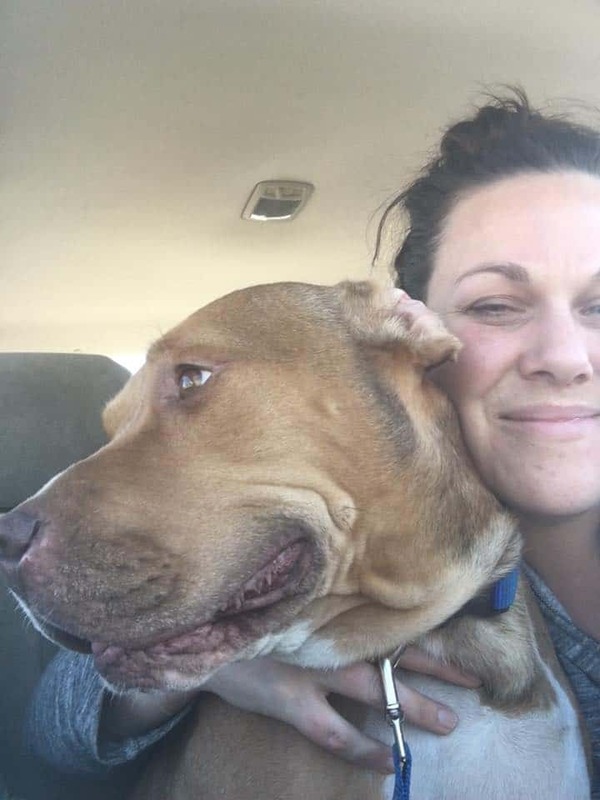 Good luck, Deb!! And if you don’t win maybe put it on your Christmas list — these boards make excellent gifts! Sounds delicious! Cutting board is awesome! Your recipe sounds amazing! We love making pizza at home as a family. The cutting boards are beautiful! Thanks for the giveaway. Thanks Amy! Pizza nights are the best. Good luck! The cutting boards are beautiful! This recipe looks absolutely delicious. I am looking forward to making a pizza with the garlic sauce instead of the usual tomato sauce. Thanks, Mary! Sometimes it’s nice to use a sauce that’s a little less acidic. I think you’ll love it 🙂 The sauce is great on pasta, too! Recipe looks great and so does cutting board! 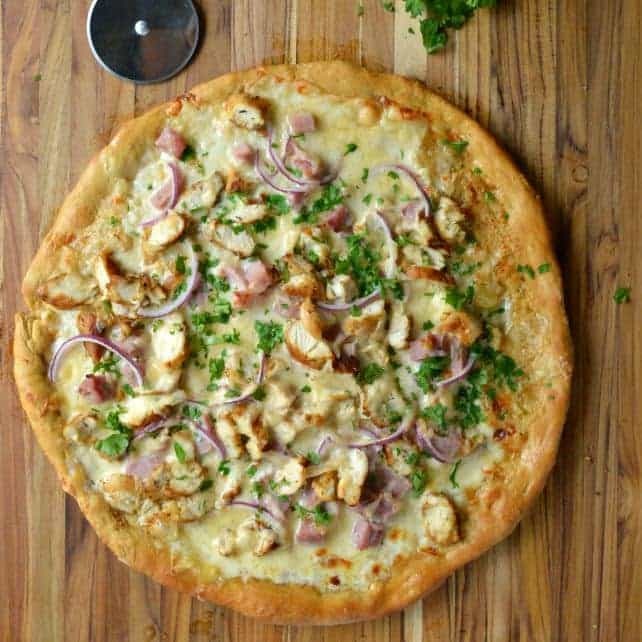 Oh my word I can’t wait to make this friday for pizza night!!! YES! I hope you’ll try it, Lindsay! What a great idea for a pizza! Thank you! It’s a winning flavor combo! Delicious! It looks even yummier on such a gorgeous cutting board! Thank you for the wonderful giveaway. Thanks so much, Erin! Good luck! I like that the website has environmentally friendly products and a large variety to choose from. The chicken cordan bleu look yummy. Unable to eat it now but after sx watch out! I would definitely love a good Boos cutting board. Thanks Stephanie! 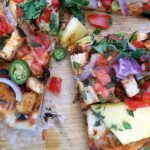 I have all good things to say about all the boards at cuttingboards.com! Yeah.. I need this pizza and this cutting board in my life! 🙂 Looks insanely delicious! I can’t decide which I like more 🙂 Thanks, Courtney! I’m in pizza heaven! Love it! The recipe sounds delicious! I will definitely be adding it to my Pinterest board. 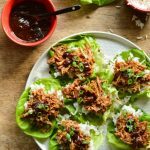 Thank you so much for sharing such a wonderful recipe and giveaway. I’m definitely going to make that garlic sauce for my next gluten-free pizza at home! Also, I adore both of those cutting boards! So much nicer than any I have! Fingers crossed for you, Michelle! Every great cook deserves an awesome cutting board!! This recipe looks off the hook! Mouth watering! You have excellent taste in cutting boards! I love my John Boos in maple but would looove the Proteak edge grain–SO pretty! And I could use some of this cordon blu pizza right now! This Proteak board is amazing, Laura. Thanks for entering! What a creative pizza flaovr! It looks awesome! And what a fun giveaway – hope I win! Thanks for hosting! We absolutely LOVED the creamy garlic sauce in the pizza! This would also work well using in a pasta dish with the chicken or ham, I think. Wood cutting boards are the best! Thank you Anne! I’m so glad you tried it! And YES. That sauce is awesome on pasta. Good luck with the giveaway! Could you tell me how many inches in diameter your finished pizza is? It will help me judge how many I need to make formy own family. Thanks! P.S. As superb as it looks, I wish we could have also seen some process pictures. I had to stop and imagine one of your ladling the garlic sauce on the crust–ahhh! Hi Chris! Thanks for the feedback! I’ll be honest – I hate doing process shots 😂My good lighting is not in my actual kitchen so it is a lot of running around with uncooked food and trying to keep it away from my dogs when I do process shots. I will eep this in mind though! My pizzas are usually around 12″. I am not super particular and sometimes will stretch to 14″. Basically I pull it enough to leave a lip of crust and not tear the center. Hope you enjoy!